Update 14 oktober 2015: Mooi hoor. De Proterra Catalyst bus reed op een testbaan in South Carolina maar liefst 412 kilometer bij een gemiddelde snelheid van zo’n 50 km/h. Volledig elektrisch. Proterra wil het battery pack nog met twee cellen uitbreiden tot tien stuks waardoor het vermogen uitkomt op 321 kWh (nu 257 kWh). Opladen van het batterypack duurt bij snel laden slechts tien minuten en bij normaal laden ook niet echt lang: anderhalf uur. 12 maart 2009: Mooie bus en het mooiste is wel het feit dat de Proterra bus verkrijgbaar is in een 100% elektrische uitvoering. Geweldig toch? Helemaal zero-emission openbaar vervoer. Dat zet zoden aan de dijk. Zou voor Nederland toch een geweldige oplossing zijn, zeker gezien het feit dat er hier geen enorme afstanden moeten worden afgelegd. Uiteraard is er in Amerika ook een hele mooie schoolbus: de Proterra BE-35 Battery-Electric School Bus. Montreal’s public transit system will be entirely electric by 2025, says the Société de transport de Montréal, making the city the first in North America to pledge to use only zero-emission – and zero-noise – vehicles. The STM is currently waiting for a shipment of 380 new diesel buses, with a lifespan of about 15 years, said Carl Desrosiers, chief of operations for the STM. But these will be the last of their kind in Montreal. In the meantime, the corporation will begin to introduce more efficient, and less polluting buses starting next year. According to its action plan, released yesterday, in 2011 it will start testing electric, articulated trolley buses, linked to overhead wires, to be used eventually on some of the busiest bus routes, like Pie IX Blvd., Henri Bourassa Blvd., Saint-Michel Blvd. and Notre Dame St. These Proterra coaches, which make a loop between downtown Reno and the University of Nevada/Reno campus, get fast-charged at 480 volts from an overhead docking station. A wireless connection guides them the last step of the way. A new study by the National Renewable Energy Lab tabulated data collected by Proterra electric buses operated by Foothill Transit in southern California and other buses in the Foothill fleet that were powered by compressed natural gas. The results show the Proterra buses were up to 8 time more efficient than their CNG powered cousins. When operated on the same route, average fuel economy for the CNG buses came to 2.1 miles per diesel gallon equivalent. By contrast, the Proterra electric buses had an observed MPDGe of 17.35 — more than 8 times higher. Cost of fuel per mile worked out to be 41 cents for the electric buses and 50 cents for the CNG-powered vehicles. On balance, the Proterra electric buses are operating well in commercial service and equal or exceed the expectations of the transportation authority, which plans to transition to 100% electric buses by 2030. Another entry in the good news column is that the cost of the Proterra buses has declined by more than one third since Foothill Transportation bought its first Proterra buses in 2009. They cost $1,200,000 a piece back then versus $789,000 each today. A Proterra E2 electric bus will be used for a 3 month trial period starting this month and ending in October at Zion National Park in Utah. Buses at Zion routinely carry up to 105 riders per service hour, compared to an average of 58 riders per service hour for the New City bus system. That means every bus is entirely filled on virtually every trip it makes all day, every day. US-based electric bus manufacturer Proterra upgraded its 40-foot Catalyst E2, now called ‘Catalyst E2 max‘, with a massive 660 kWh battery pack and brought it to the track at the Navistar Proving Grounds in New Carlisle, Indiana, to test it. Unsurprisingly with that insane amount of battery capacity in the vehicle, they beat the record for the most distance traveled on a single charge by an electric vehicle. The Proterra Catalyst E2 max traveled 1,101.2 miles before its battery pack was depleted. SporTran of Shreveport, Louisiana embraces the future with the adoption of five brightly colored 40’ Proterra Catalyst E2 buses. 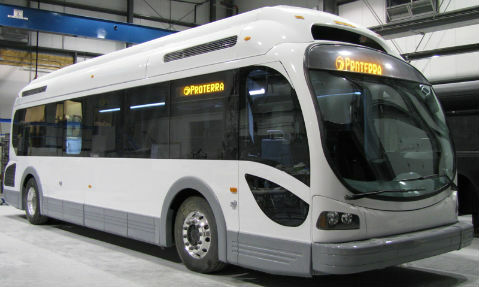 Electric bus maker Proterra announced the University of Georgia has ordered 20 of its Catalyst E2 buses. Upon deployment, the university will have one of the largest electric bus fleets in the U.S. The 40-foot Catalyst E2 buses will displace more than 2.5 million gallons of diesel over the vehicles’ 12-year lifespan and eliminate over 4.5 million pounds of carbon emissions annually, Proterra says. University of Georgia buses have an average daily ridership of about 40,000, offering free rides for students, faculty and visitors around Athens, Ga. The university received a $10 million grant to evaluate and test electric buses — the state of Georgia underwent a “similar testing and review process,” selecting Proterra as a statewide e-bus vendor. The university procured the buses under a statewide contract. Proterra’s Catalyst E2 buses feature the manufacturer’s DuoPower drivetrain, which it introduced in 2017 and later put to the test on some of Utah’s steepest roads. The drivetrain features two electric motors which deliver 510 horsepower and can propel the bus up a 26 percent grade. The University of Georgia estimates energy costs for operating the South Carolina-built buses will equal less than $10/day per bus, while energy costs for a similar diesel bus total $90/day per bus. Proterra’s buses are expected to arrive on campus during the 2019-20 academic year.